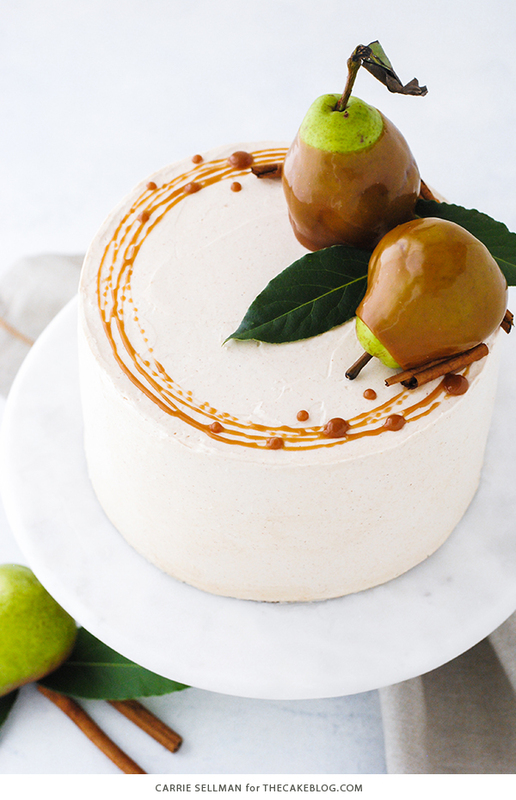 Salted Caramel Pear Cake – fresh pear cake with cinnamon buttercream, salted caramel and homemade caramel dipped pears. The calendar might not agree, but it feels like fall has arrived. The weather is cool, crisp and as I look outside, I can easily spot the first few leaves that are starting to turn on our towering oak tree in the back. This is by far my favorite time of year. Why? I honestly cannot say for certain. Maybe it’s because autumn signals the return to normal routines around here. School, work, weekends spent at the park and watching football. When the weather takes that first dip towards moderate, the mosquitos slowly die off and our family gravitates towards the outdoors. Sporting layers of clothes to balance the crisp autumn air, we ride bikes more, go on trail walks more, breathe in the fresh air more. The excitement of the approaching holiday season is on the horizon — it’s all just so familiar and comforting. This time of year is also my favorite for the blog. 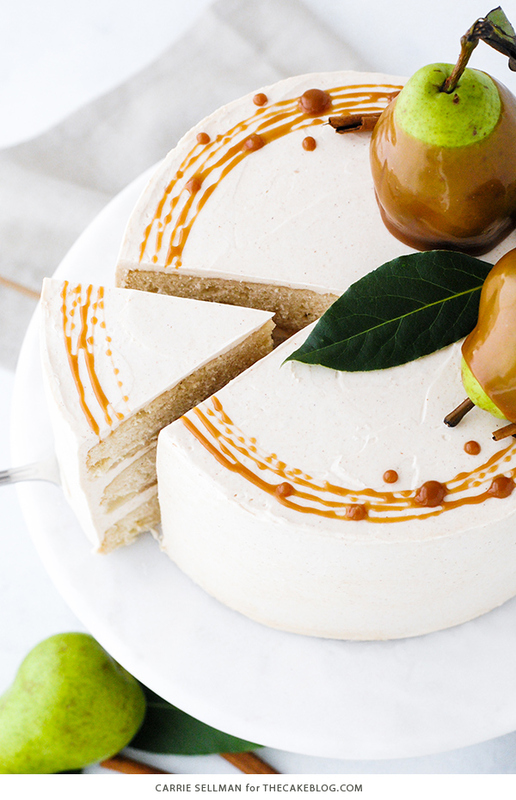 The cooler weather beckons back into the kitchen, luring us in with the likes of apples, cinnamons, caramels and rich fall flavors. This year I wanted to give a little love to our dear friend, the pear. My family eats almost as many pears as apples, yet I tend to bake with them less often. 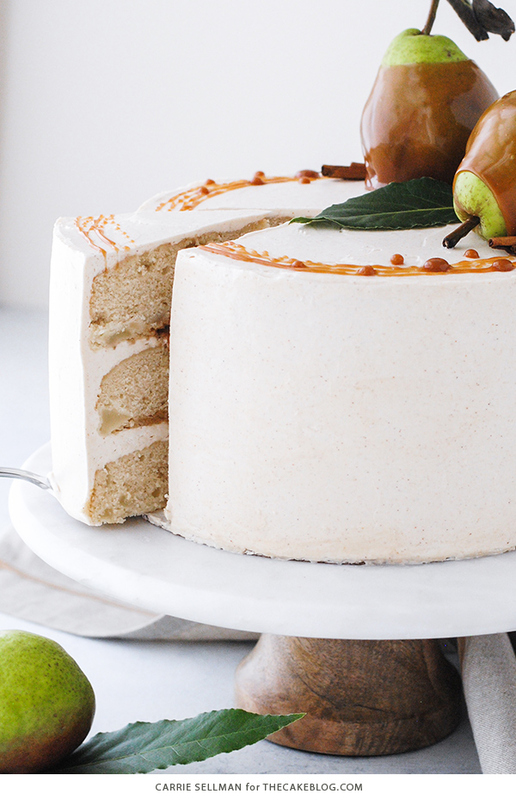 So in an effort to try something new, this Salted Caramel Pear Cake was born. A classic butter cake gets a hefty dose of chopped pear and warm cinnamon. As it bakes, the house is filled with the most glorious aroma. Then comes the cinnamon buttercream that’s as silky and smooth as can be, with the teeniest flecks of earthy brown from the ground cinnamon. And let’s not forget the homemade salted caramel. It’s easier than you think and is so much better than that “caramel” in the jar that’s predominantly made of corn syrup. 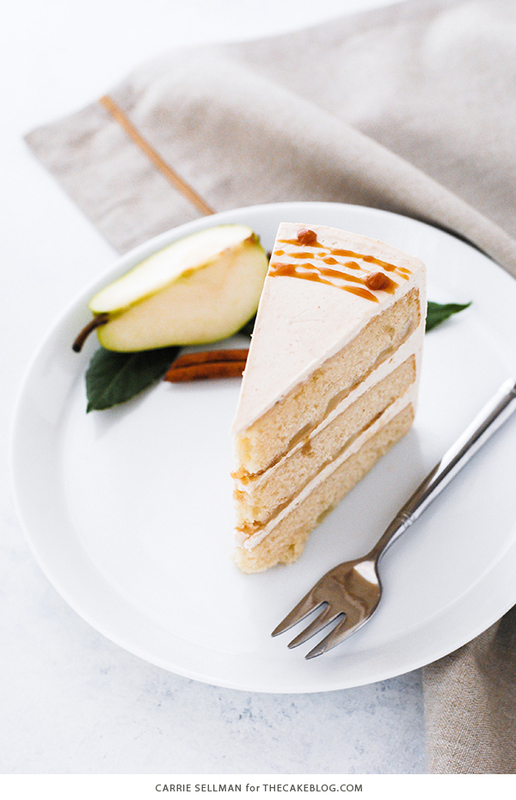 Make it once and then let the caramel pull double duty in this recipe — it’s drizzled between the layers and also acts as the elegant dip for our pears. The whole thing is delectable and undeniably fall. Sift together 3 cups cake flour, baking powder, salt and cinnamon. Set aside. 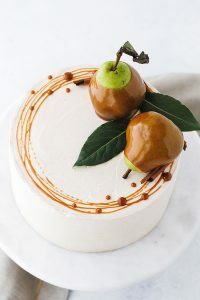 In a small bowl, gently toss diced pear with 2 tablespoons cake flour to coat. Using a spoon or spatula, gently fold pear chunks into batter, being careful not to smash the pear. Bake for 25-28 minutes, until toothpick inserted into center comes out clean. Add vanilla extract and cinnamon. Continue mixing on low to med-low until silky and smooth, about 3 to 5 minutes. The buttercream may look like it’s broken at some point. Keep mixing until it is completely smooth. Liberally spray a baking sheet with cooking spray or line with parchment paper. In a 3-quart stainless steel saucepan, combine water, sugar and salt over medium heat. Using a fork, stir 4-5 minutes until sugar dissolves and mixture comes to a boil. Stop stirring. Continue to cook without stirring for 10-12 minutes until mixture is a golden honey butterscotch color. Add cream (be careful as the mixture will bubble A LOT). Reduce heat just a tad. Stir constantly with a rubber spatula for 10-12 minutes until mixture reads 250F on a candy thermometer. Remove from heat and carefully pour into a glass measuring cup. Let cool, stirring occasionally, until mixture is thick and ready for dipping, about 180F. 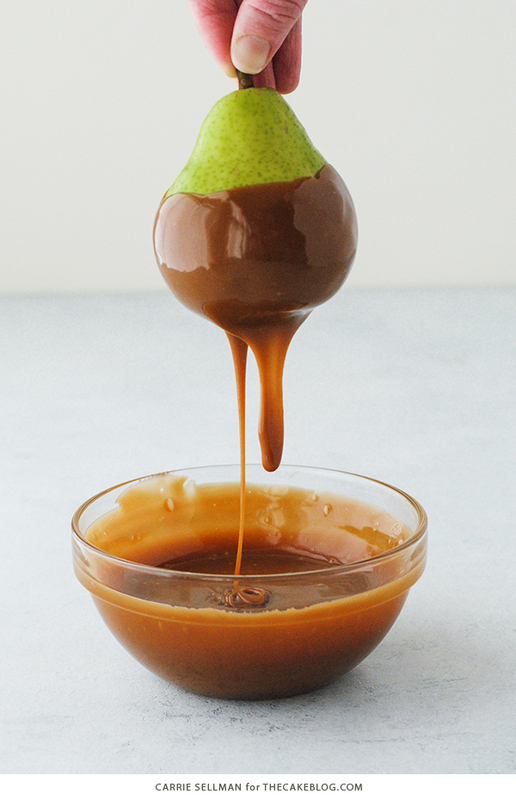 Dip pears into caramel, allowing excess to drip off back into the measuring cup. Place pear onto baking sheet and allow to set for 10 minutes. Caramel will remain pliable even once set. If too much caramel puddles at the bottom, simply pick up pear and gently remove some of the excess. Allow pears to set. Excess caramel will be used in the cake assembly. Place one layer of cake onto serving plate or cake stand and top with about one cup of cinnamon frosting. Drizzle with salted caramel sauce remaining from pears. If needed, slightly warm caramel so that it drizzles again, but allow to cool slightly before putting onto frosting so frosting doesn’t melt. Repeat with second cake layer, more frosting, more caramel and then last layer of cake. Crumb coat and frost cake with remaining frosting. Decorate by drizzling thin strands of caramel into a circular pattern along outside edge of cake. Add a few circular drops of caramel here and there. 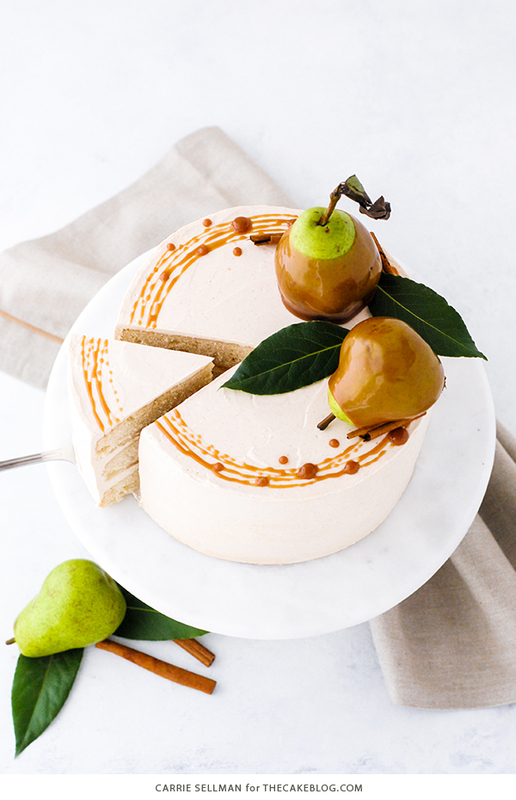 Place pears on one side of cake and tuck in a couple of bay leaves around them. Break several pieces of cinnamon stick to place along pears as well. When making the salted caramel, the 3-quart stainless steel saucepan is a must. The mixture will bubble A LOT and using a smaller pan will result in a huge overflowing mess. If you like the appearance of one pear standing and one laying on its side, be sure to set them that way on your tray when you first dip them. The caramel will pool and firm with the correct “bottom area”, depending on how you want them placed. I made the small dots of caramel when I dipped the pears. Just drop a little dab on to your baking tray and it will form the prettiest little dot. Once set, lift off with a small offset spatula and place on the cake. Breaking the cinnamon sticks takes some might but gives them a more rustic appearance. How far in advance can the cake be assembled before serving? I plan to make the cake and butter cream ahead of time and freeze, but how early can I make the caramel sauce, assemble and decorate? If I want to serve on Saturday, is it too early to assemble and decorate on Thursday evening? The cake and pears will keep for several days in the refrigerator. So you would be fine assembling and decorating on Thursday for a Saturday event. Just store the whole thing, in the refrigerator. I usually put the finished cake into the fridge for 30 minutes or so until it is cold and firm. Then bring it out and lightly wrap it with plastic wrap. This way it’s wrapped and protected but there’s less chance of messing up the frosting with the plastic wrap. Then it will be set for several days. Hope that helps! Hi Carrie!! 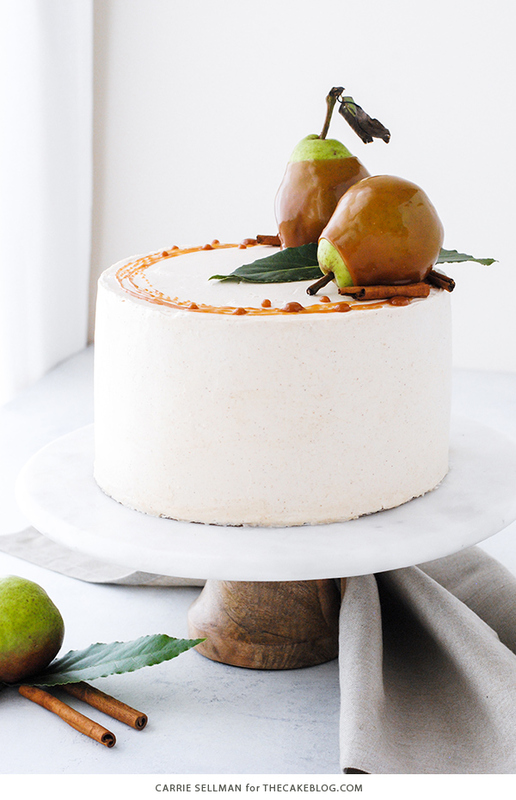 I am planning to make this cake over the weekend for a birthday and wondered if you’d ever tried finely shredding the pears instead of dicing them? No, I haven’t, but shredded pear should work just fine if not better than diced! Either way would be good – it really just depends if you want to see the chunks of pear or not. The diced pear does have a tendency to sink so if that bothers you, perhaps go with the shredded. Let us know how it goes! I’m wondering if you have ever made a larger cake with this recipe. Either sheet pan size or a large round cake. This cake unfortunately did not pan out for me (excuse the pun). 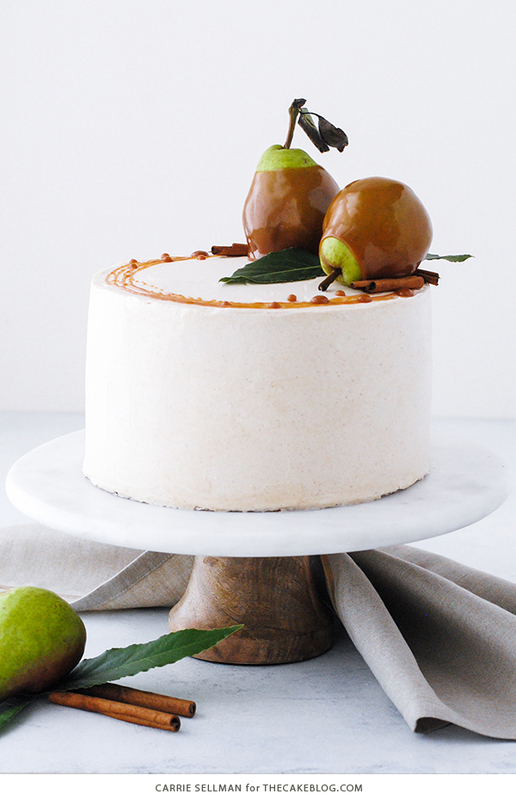 While I appreciated the flavor of the cake layers themselves and the moistness the baked in pears added, it was so crumbly (somehow without being dry) that we couldn’t get a clean slice. Everyone’s plate was a piece-meal mess which generally wouldn’t bother me but I could see it being disappointing for a birthday. Swiss meringue buttercream is one of my favorite things to make and while this one gave me absolutely no trouble (including no transitional appearance of curdling), the flavor wasn’t there to justify the extra steps. The caramel however was the biggest let down as I definitely ended up overcooking it in trying to get it to the desired temperature. I should’ve listened to my instincts and pulled it off sooner knowing I’d want to drizzle it on the cake as opposed to make candy with it as it ended up pliable and chewy. Admittedly, I bake as a hobby, not professionally, but none of these elements are new to me save for the specific flavor profile so I am not really sure I can chalk it up entirely to technique missteps. The flavor profile intrigued me and if the caramel had turned out, maybe that would’ve enhanced the cinnamon frosting and added additional structure to the cake but, all in all, I’m glad I didn’t end up breaking this out for Thanksgiving as intended. 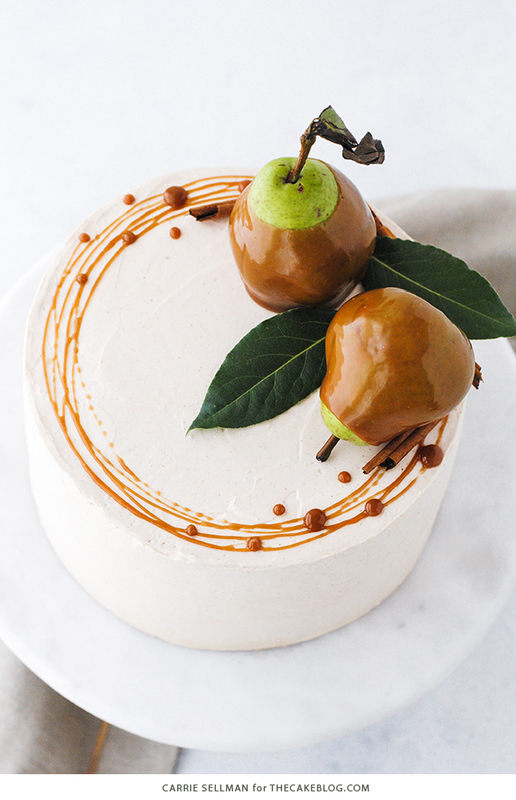 On the plus side, caramel dipped pears on top of an iced cake look stunning but, the inside sadly didn’t measure up (OK, this time pun intended).